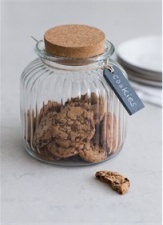 The beautiful Cornbury Cookie Jar can sit on kitchen tops filled with an array of delicious treats to have with a cup of tea, as an after-dinner nibble or midnight snack. The ribbed Glass design has a vintage aesthetic teamed with the rustic Cork lid and Slate tag. It comes complete with chalk to label the contents whether customers choose to fill with cookies, granola, sweets and more. The chunky lid makes it easy to grab goodies on the go and visually looks beautiful stored in the kitchen for all to see.